Home » VectorVest » Buy the value opportunity that exists right now at Vedanta Resources (VED) says VectorVest. Buy the value opportunity that exists right now at Vedanta Resources (VED) says VectorVest. By Alan Green in VectorVest on 29th August 2017 . 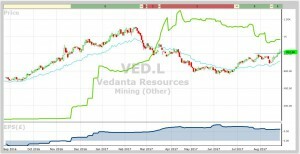 Vedanta Resources (VED.L) is a natural resources company engaged in exploring, extracting and processing minerals, oil and gas. VED produces zinc, lead, silver, copper, aluminium, iron ore, oil and gas, and commercial power. Originally the Shamsher Sterling Corporation founded by Anil Agarwal in 1979, the company has grown steadily and now has operations located in India, Zambia, Namibia, South Africa, Liberia, Ireland, Australia and the UAE. Its segments include Zinc-India, Zinc-International, Oil & Gas, Iron Ore, Copper-India/Australia, Copper-Zambia, Aluminium and Power. Its geographical segments include India, China, Far East Asia, Middle East, Europe, Africa, Asia Others, UK and Others. Its Copper business includes a copper smelter, over two refineries and over two copper rod plants in India; a copper mine in Australia, and an integrated operation in Zambia consisting of approximately three mines, a leaching plant and a smelter. The Company’s oil and gas operations consist of the assets of Cairn India Limited in India, Sri Lanka and South Africa. The VectorVest stock analysis and portfolio management system alerted members to the sharp falls in the VED share price after the stock hit its year high of 1,100p on Feb 15 2017. The stock dipped under 600p several times during May and June 2017, moves that triggered a VectorVest buy rating as a result of positive scores across a number of key metrics. These include Earnings Growth Rate (GRT), (reflects one to three year forecasted earnings growth rate in percent per year), which logged a rating of 35% that VectorVest considers to be excellent. Additionally, the VST-Vector, a master indicator that combines a number of key metrics rates VED at 1.38, which is very good on a scale of 0.00 to 2.00. As a result VectorVest has a valuation rating for VED of 963p, well ahead of the current 822p. The chart of VED is shown above using my normal notation. Of note is the rounded bottom that the share has charted during most of 2017. The formation charted since April 2017 is that of a “cup and handle” pattern which chartists believe precedes a strong directional move. The share has broken out of the handle of the overall cup and handle pattern over the past few trading sessions. This is a very bullish chart. Summary: As with my recent article on KAZ Minerals, it is important to note that it is not FIB, moving averages or oscillators that are driving the VED share price higher. 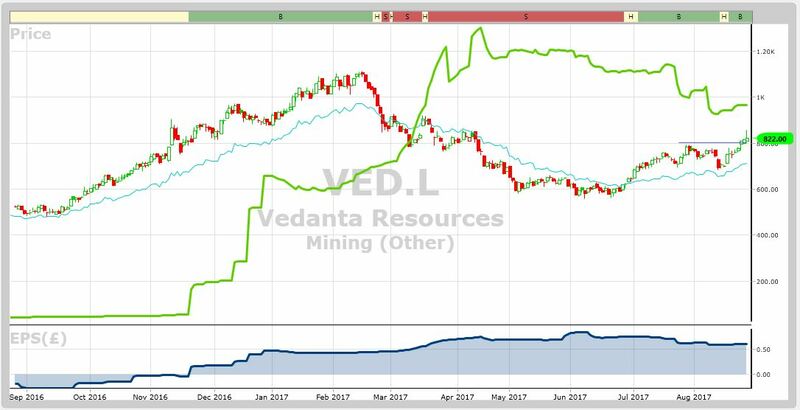 It is the solid revenue and EBITDA growth driven by VED’s exposure to a broad range of essential raw materials and resources including copper, zinc, iron ore, aluminium, oil and gas. The fact that VED has been able to refinance at such favourable rates well illustrates investor appetite and expectations for growth in a company with such a broad and diverse offering, and further underscores the value opportunity that exists right now. VectorVest rates VED a BUY. Readers can examine trading opportunities on VED and a host of other similar stocks for a single payment of £5.95. This gives access to the VectorVest Risk Free 5-week trial, where members enjoy unlimited access to VectorVest UK & U.S., plus VectorVest University for on-demand strategies and training. Link here to view.